Intimidation Clothing is pleased to announce their sponsorship of seven different fighters on Saturday’s King of the Cage: Homecoming card. King of the Cage, one of the most well-known MMA promotions in the sport’s history, has a Middleweight Championship fight scheduled featuring two fighters sponsored by the Intimidation brand including Champion Brandon Hunt (7-2) and top contender Angelo Popofski (15-9). The KOTC event will take place at the Soaring Eagle Casino in Mt. Pleasant, Michigan on Saturday night, September 24th beginning at 8 pm ET with Intimidation products available for sale to the public at the event. In addition to the sponsorships of Hunt and Popofski, Intimidation will also be sponsoring Christos Piliafas, Adam Alvarez, Dingo Brown, Deon West and Mike Musslewhite. Hunt, Popfski, Piliafas, Alvarez & Brown all hail locally from the state of Michigan. A member of James Lee’s MASH Fight Team, all 9 of Hunt’s professional fights coming for the King of the Cage promotion. Popofski, who has lost both of his last two fights, looks for redemption after losing his title shot to Hunt in September 2010 by 2nd round TKO and will fight for KOTC for the 7th time in his career. In addition to the 5 Michigan-based MMA fighters at KOTC: Homecoming, Intimidation also has two Ohio-based fighter in action as well with Super Heavyweight Deon West and Middleweight Mike Musslewhite. Deon “The Franchise” West (2-2) fights out of Mansfield, Ohio but has not fought since a decision victory in July 2010. Musslewhite (3-8) looks for his 4th win in his last 7 fights as he faces Jason Ireland (17-8-1), a Michigan-based fighter who has not stepped into the cage since 2007. Interestingly enough Musslewhite has never seen a fight go past the 1st round with all 11 of his fights, both wins and losses, being finished within the first 5 minutes of action. As the month of August comes to a close, we look back at what was yet another awesome month of growth for the company. But while the Summer of 2011 proved to be a great one for our company, a look ahead to September shows an even brighter sky. With a fan base and following based mostly in the Midwest United States, things will be changing shortly as the Intimidation brand looks to further solidify our place regionally while exponentially increasing our national exposure in September. The month will start off strong with two of the Cincinnati region’s most popular fighters in action and sponsored by Intimidation this weekend in Mojo Horne and Chris Bennett. The Annihilation Productions “Riverfists” event takes place on Sunday, September 4th at the Ohio Riverfest and features free admission for fans. Less than a week later on September 10th, Intimidation Clothing will be lighting up the television screen with four different Bellator Welterweight Tournament participants sponsored in the first round of their 170 lb Season 5 Tournament. Luis “Sapo” Santos, Steve Carl and Ben “Killa B” Saunders, also a 7-time UFC vet, will all be in action and will all be fighting for Bellator on MTV2. Santos will be wearing authentic Intimidation MMA board shorts. That same night, Intimidation Clothing will be on hand at NAAFS: Combat Challenge 15 in Akron, Ohio as an official event sponsor. One week later, Intimidation will once again be featured on MTV2 as Brian “The Predator” Rogers makes his Bellator debut fighting in their Middleweight Tournament against fellow Ohio fighter Victor O’Donnell. Intimidation board shorts will be featured again Rogers is currently giving fans the option to choose his Bellator shorts (pictured) for the fight on Intimidation’s Facebook page. On that same night, although not officially sponsored by Intimidation Clothing inside the cage, Donny “Eagle Eye” Walker will fight at UFC Fight Night 25 in Louisiana. During the weekend of September 24th, the company will experience the biggest weekend in it’s over two year history. One night after another Intimidation sponsored event in Minneapolis, Minnesota, Intimidation is expected to be on hand at Bellator 51 in Canton, Ohio, where the company will have Bantamweight Tournament participants Ed West and Alexis Vila sponsored for the live MTV2 audience. In addition, Intimidation has already come to terms to sponsor several of the undercard fighters including Jessica Eye, Dan Spohn, John Hawk, Joey Holt, Dustin Kempf and more. On the same night, with King of the Cage in Mount Pleasant, Michigan, Intimidation will sponsor no less than 7 fighters on the card including KOTC Middleweight Champion Brandon Hunt, a member of the MASH Fight Team. Bo Harris continued to show why he is one of the best Bantamweight prospects in Mixed Martial Arts this past weekend. Sponsored by Intimidation Clothing, Harris faced off with Adrian “The Bully” Wooley (7-3) in the Global Warriors Fighting Championship main event. The event, entitled “Uprising,” took place on August 13th in Hamilton, Ontario, at the Hamilton Place Theatre. Harris (6-2-1) won his 3rd straight fight, all three of which have come North of the border as he defeated Wooley by Split Decision. A member of the MASH Fight Team in Detroit, Michigan, Harris was originally scheduled to face Wooley at Bellator 47 in Rama, Ontario. A professional for three years, Harris is also a 2-time King of the Cage veteran and a veteran of the MFC. Intimidation Clothing is a fast-growing brand of MMA apparel & gear based in Ohio with a strong presence throughout the Midwest USA. In addition to over 40 styles of high-quality, bold t-shirts, the company is also becoming known for their premium-quality MMA fight shorts, rashguards and more. Fans can like Intimidation on Facebook and follow Intimidation Clothing on Twitter @IntimidationMMA. Intimidation Clothing is pleased to announce the sponsorship of Bo Harris for his upcoming fight on August 13 for the Global Warriors Fighting Championship. The event, entitled “Uprising” will be held in Hamilton, Ontario, on Saturday night at the Hamilton Place Theatre. Harris (5-2-1) is coming off consecutive wins, both of which have come North of the border as he defeated Chuck Mady in April for the popular MFC promotion and Brent Franczuz at a JEG event in May. His opponent, Adrian “The Bully” Wooley (7-2), will look to shake off his recent loss and show why he is considered one of Canada’s top prospects per a Global Warriors press release. Harris, a MASH Fight Team product our of the Detroit, Michigan area, will be battling Wooley in the night’s main event. A professional for three years, Harris is also a 2-time King of the Cage veteran and was originally scheduled to face Wooley at Bellator 47 in Rama, Ontario. Intimidation Clothing is a fast-growing brand of MMA apparel & gear based in Ohio with a strong presence throughout the Midwest USA. In addition to over 40 styles of high-quality, bold t-shirts, the company is also becoming known for their premium-quality MMA board shorts, rashguards and more. 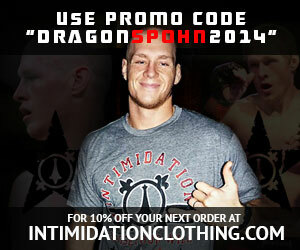 Fans can like Intimidation on Facebook and follow Intimidation Clothing on Twitter @IntimidationMMA.